Interstate Crane Hire operators always ensure quality and safety is maintained on the work sites. Operators will also ensure the job can be done safely and the ground conditions are satisfactory based upon weather conditions and the capacity of the crane. 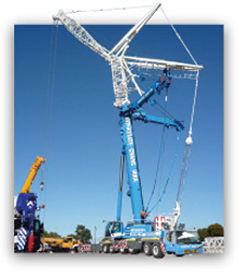 Interstate Crane Hire riggers are Advanced Riggers with extensive experience with ensuring the correct pulleys, booms, braces and cables are the right capacity for the job. Our transport division provides a specialised service in the transporting of over-dimensional and oversize loads throughout Western Australia servicing a wide range of companies in the Mining and Engineering sectors, All of our vehicles are well signed and maintained for a professional look and your peace of mind.